Far too many to choose one. One of many is during the "superman" scene where Michael realizes it is Fredo that went against the family when he says he and Johnny Ola have been to the club before. The look of betrayal on Michael's face when he heard that was palpable. It was almost as powerful as the scene in "Mystic River" when Sean Penn realizes it's his daughter who was killed and his reaction to it. 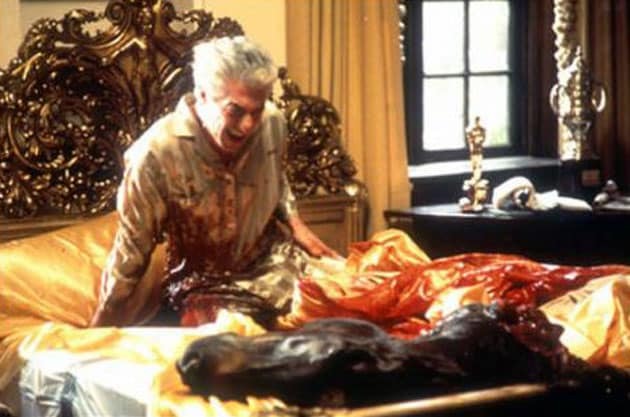 Either the baptism “do you renounce satan scene” or the horses head in the bed scene. The Al Pacino crying scene at the end of 3 with Cavalleria Rusticana Intermezzo playing. This right here. This is when Michael's heart crosses over. <<<<<<<< I also go with Fredo on the Lake. Part II- Vito following the Black Hand along the rooftops, and the scene in the stairwell with the lights turning on and off while Vito has the towel wrapped around his hand. Honorable Mention- Fredo and the boat. This is actually probably the best scene but its pretty obvious. I've seen this movie dozens of times, but it took me several viewings before I really noticed Michael's full reaction. Well after he hears Fredo bragging the camera pans out and Michael puts his head in his hand. Also notice the girl Fredo's with at this same point (about 1:48) looks like Jennifer Lawrence. Toward the end of GF3 when Mary gets killed, because this mercifully ended Sofia Coppola's acting career.